Before fashion designers Chanel, Michael Kors and Christian Dior made chronograph watches a fashionable choice for women there was TechnoMarine watches. The brand single-handedly revolutionized the watch industry in the late 1990’s and early 2000’s with the introduction of bright and colorful Swiss-made chronographs for men and women with water-resistance to 200 meters. Prior to the introduction of the TechnoMarine Cruise and Techno Diamond series, chronographs were made expressly for men… and women’s watch fashions were also considerably more diminutive in size as well. Both the Techno Diamond Chronograph for women and the Cruise unisex chronograph featured stainless steel cases that measured approximately 39mm in diameter. Each came with a bright and colorful interchangeable clear gel silicone strap and matching case cover. Both collections were widely popular when they debuted, however the Techno Diamond Chronograph featuring two shimmering rows of inlaid diamonds, pave-set on the perfectly round unidirectional rotating bezel was a global fashion phenomenon. 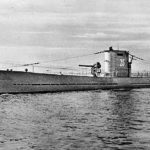 The who’s who of film and recording stars along with fashion trend-setters were seen wearing a TechnoMarine Techno Diamond chronograph on their wrists at that time. The Techno Diamond collection not only offered an innovative synthesis of dress and sport watches for women, the interchangeable straps available created a wide variety of colorful fashion options too. Sixteen years later, TechnoMarine still offers a wide variety of fashionable chronographs, many with the clear silicone straps and diamond accents on the bezels that the brand is famous for. 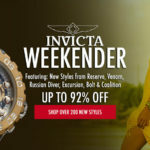 You’ll find all of the latest TechnoMarine watches at WorldofWatches.com, including styles from the popular Cruise, Reef, Manta, Blue Manta, Black Reef, Sea Manta and Neoclassic collections. The TechnoMarine Cruise women’s chronograph captures the innovative and sporty characteristics of the original with an updated round, contoured case in polished white ion-plated stainless steel, presented on an attractive white silicone strap. The unidirectional rotating stainless steel bezel with raised markers surrounds the multi-layered silver colored chronograph dial with three sub-dials, an automatic date calendar, luminous hands and hour markers. Features include 1/10th of a second, small-second and 30-minute registers. 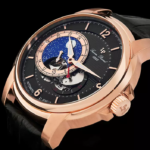 Additional features include premium Swiss-made quartz movement inside, along with a locking screw-down crown and case back for water-resistance to 200 meters or 660 feet. 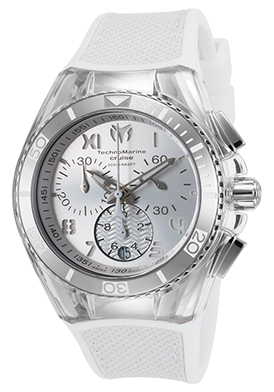 TechnoMarine women’s Cruise chronograph is 40mm in diameter and 14mm thick. 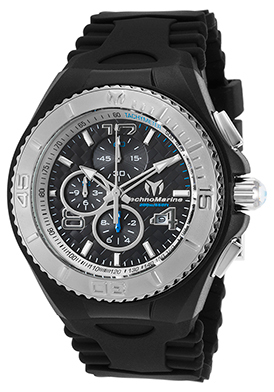 The TechnoMarine Cruise Chronograph for men features the updated round case in black ion-plated stainless steel with a horizontal pattern black silicone strap. The unidirectional rotating stainless steel bezel surrounds the black dial with a tachymeter outer dial, three sub-dials, luminous hands and hour markers. 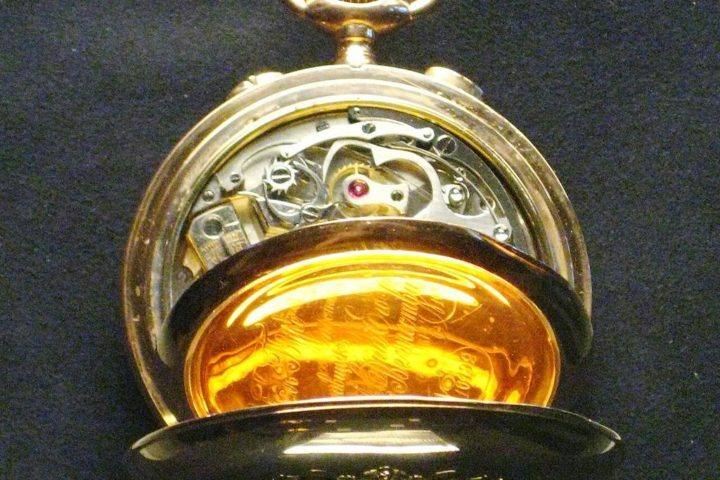 Features include an automatic date calendar at the 4 o’clock hour, 1/10th of a second, small-second and 12-hour countdown timers. A locking screw-down crown and case back offer water-resistance up to 200 meters or 660 feet. Quality quartz movement inside assures you of accurate time-keeping. 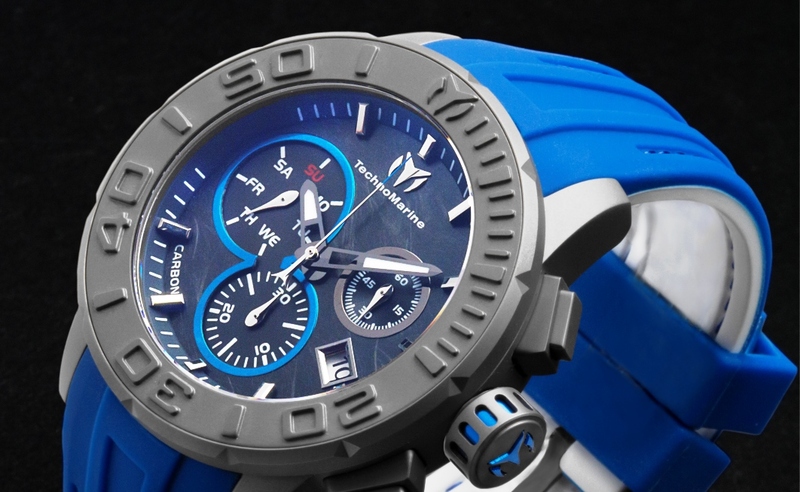 The TechnoMarine men’s Cruise chronograph is 46mm in diameter, 14mm thick and features quality quartz movement inside. 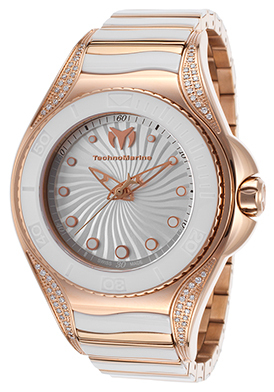 The TechnoMarine Blue Manta women’s watch offers a brilliant and alluring profile for today’s woman in shimmering diamonds, lustrous rose gold-tone stainless steel and white ceramic. This breathtaking women’s watch features the round contoured case in rose gold-tone stainless steel, highly polished to a mirror-bright patina. The case is beautifully integrated into the dramatic horizontal wave pattern bracelet in lustrous rose gold tone stainless steel with lustrous white ceramic accent links. Sixty-eight shimmering round-cut diamonds create a dramatic focal point on the exterior of the bezel and lugs. The unidirectional rotating bezel in rose gold-tone stainless steel has a lustrous white ceramic top with and distinctive coin-edge rim. The wave pattern white dial shines with skeleton hands and luminous cabochon dot hour markers. Premium Swiss-made quartz movement inside assures you of precise time-keeping accuracy. Features include a screw-down crown and case back for water-resistance to 200 meters or 660 feet. TechnoMarine Blue Manta women’s watch is 38mm in diameter and 11mm thick. 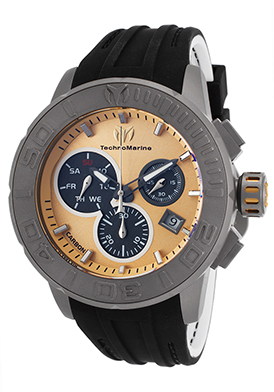 The TechnoMarine Titanium Reef Chronograph is an excellent selection for men. The robust 48mm diameter, 16mm thick case in satin finished brushed titanium is extremely lightweight and exceptionally comfortable. The attractive black silicone strap has a white silicone lined interior. The titanium unidirectional rotating bezel with raised markers encircles the gold colored carbon fiber dial with three sub-dials, luminous hands and hour markers. Features include an automatic date calendar, day-of-the-week, small-second and 30-minute registers. A scratch-resistant sapphire crystal covers the dial. Quality Swiss-made quartz movement inside assures you of precise time-keeping accuracy. A locking screw-down crown and case back provide water-resistance to 100 meters or 330 feet. 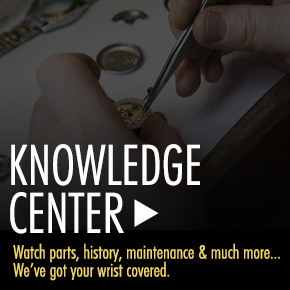 Whats New At World of Watches: Choose From Hundreds of New Arrivals All Up to 90% off.